Often we are reminded of a passage in Matthew about what it means to forgive. Peter asks Christ how much he should forgive someone? Seven times? Christ comes back with the answer of seventy-seven times. Does this mean if number seventy-eight comes up we do not have to forgive? Obviously not! So what does this passage mean? What does it mean to forgive? First, let’s look at the text itself. This is a stunning passage, a convicting passage. Often we find ourselves as the one who has been released from a great debt refusing to forgive the one with a small debt. But again, what does it actually mean to forgive. The word forgive in this passage is the Greek word ἀφήσω (aphiemi). And what does this mean in the original? ἀφήσω carries the idea of releasing from a legal or moral obligation (A Greek-English Lexicon of the New Testament and other early Christian literature). This has amazing implications for what it means to forgive. You have gone to court with that person and the judge threw the case out, said the person is innocent or no longer obligated to the debt, or otherwise it has been satisfied. From that point forward, from a legal sense, you act as if the wrong has been fulfilled or never occurred in the first place. It has been satisfied. When we choose to forgive we are taking that legal and moral stance. You are no longer obligated to me for what happened. I am wiping the slate clean. It is over and done. And Jesus says we are to do this seventy-seven times. This means we are wiping the slate clean, never to bring it up again. It has been cleared from the record. What a picture of grace and what God has done for us and now expects us to do the same for others. It is a tall order. It is not easy by any stretch of the imagination. But it is what we are called to do. May we all learn how to forgive. Over the last couple of years, I have had the privilege to be a part of the Men’s Bible Study led by Dr. Steven J. Lawson. We have been going through a verse by verse study of the book of Romans. While we may not be moving through Romans fast, I assure you that this has been one of the most profitable Bible Studies I have ever participated in. Dr. Lawson brings clarity to the Word like few others are able to do. He has focus and drive and his passion for the Word of God shines through with each session. You will find yourself immersed in the book of Romans and gaining insights on how this great masterpiece fits in with the whole of Scripture. 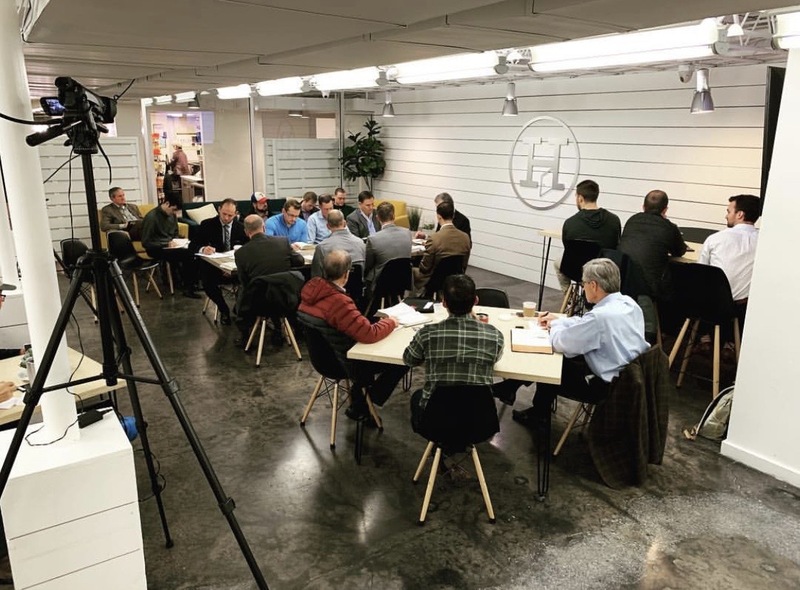 The Men’s Bible Study meets regularly. The physical group meets at Herb’s House in Dallas, TX but you can enjoy the study online via Livestream. All of the studies are recorded so you can go back and watch them again and again. I encourage everyone to watch videos of this study. You will be challenged in your faith and grow in your knowledge of Scripture. One of the things that many churches seem to have lost in today’s culture is the discipline of Scripture Memory. Growing up, Scripture memory was a huge emphasis at our church through programs like AWANA. I remember being on the Bible Quiz team for our church competing against other churches. I remember those verses and definitions that I learned decades ago and I am thankful for it. But is there any indication from Scripture that memorizing God’s Word is important? The answer is an overwhelming yes! We see verses like Psalm 119:11, “Thy word have I hid in mine heart that I might not sin against thee.” (KJV) While this verse is not a command, it is a clear principle. Hiding God’s Word in our hearts gives us the tools we need to resist temptation. Jesus was the perfect model of this in the New Testament when He went under temptation by Satan in the wilderness. This passage is found in Matthew 4:1-11. Jesus goes into the wilderness and is tempted three times by Satan. Time To Build The Kingdom? In Haggai’s first chapter we see a rebuke of the people of Israel for allowing the Temple to lay in ruin after their return from exile. On the surface, this seems reasonable, the Temple had been destroyed while the Jews were exiled out of the land and they did not immediately rebuild when the returned. However, they saw fit to rebuild their houses with possible lavishness. God recognized that Israel would not rebuild the Temple without prompting. It was simply not a priority for them. They were too busy with their own endeavors to bother themselves with the Lord’s house. There are many parallels with Israel and the Church today, particularly in America. How many times is there something that God has told us to do but we put it off? We put it off out of fear or perhaps inconvenience. We have other pursuits. Jobs, hobbies, family, the list goes on and on. Meanwhile, the Kingdom of God is waiting. It is waiting to be staffed with the people of God. It is waiting for a generation to rise up and do the Lord’s work. This does not mean that we have to give up everything and go into full time ministry. But there is something for everyone in the church to do. What are your gifts and talents? What can you do for God’s glory in His house? It is time to build the Kingdom!